Keep on doubting me and I keep on surprising you. Now I'm just not surprised when people leave, but I'm actually more surprised when they stay. We think that we know what life has to offer, but life never fails to surprise us! Find answers in your weakness and surprise in your strength and always remember the golden rule every failure has HOPES. Expectation hurts a lot when it is not fulfilled. When you don't expect, every moment is a surprise and surprises give happiness and it is happiness which counts. Life is filled with surprises, you just have to cut down your expectations. Surprises are astonishment that comes unexpectedly. Surprises are the secrets for a few things like humour or an unexpected happiness. Violent actions and sadness also catch us by surprises at times. Aristotle feels that “the secret to humour is surprise”. And surprisingly, surprise is the greatest gift that life can grant us. 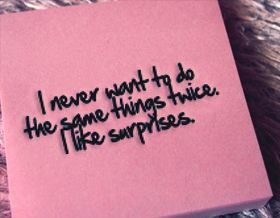 Without surprises, life will be monotonous and boring. When a husband tries to surprise his wife he is very often surprised and we see this in practical life. Francois humorously remarks, ‘the only thing that should surprise us is that there are still some things that can surprise us”. It needs a heart of iron not to get surprised by anything but it is a good feeling to get pleasant surprises as they add spice to life. Read these quotes on surprises and send them to your friends to surprise them.